Home: There’s no place like it. Dorothy told us so as she clicked her heels together to return to the place she thought she so desperately needed to escape. What a symbolic life lesson—brought to you by the technicolor dreams of a farm girl from Kansas and her tiny pup. Your home is one of your biggest comforts—and expenses. So it makes sense that home a perfect place to save money in both big and small ways. In this third lesson of our superb saving series, we’ve got 17 ways to save on utilities, insurance, renovations and mortgage or rent. 2. Buy a programmable thermostat. If you turn your thermostat back seven to 10 degrees while you’re at work, you can save as much as 10% a year on heating and cooling! (2) If you have a manual thermostat, you can add this step to your morning routine—along with tooth brushing, bagel toasting, and coffee brewing. But do you know what you can’t do with a manual thermostat? Set the temp back to normal before you return home, so you aren’t welcomed to a sauna or a meat locker. But with a programmable thermostat, you can set it and forget it! Plus, over time, you can save cash and stay comfortable. 3. Use more efficient light bulbs. About 5% of your energy budget goes to lighting. (3) One of the quickest ways to trim down the costs here is to purchase more efficient light bulbs. Pick the five most used fixtures in your house and replace the bulbs with ones who’ve earned the ENERGY STAR, and you can save about $75 a year. (4) Plus, these energy efficient bulbs are longer lasting as well, which means replacing them less often, so you save even more money. 4. Don’t leave the light on. You aren’t Motel 6. Is that reference too dated? It was their tagline back in the 80s. While it’s a welcoming gesture to leave the light on for guests or family members, it’s a big waste as well. When you exit a room, switch off the light. Train everyone in the house to do the same. Heating water can take up to 18% of your home energy use, so shower time is the perfect time to save money. (5) If you don’t want to make the switch to cleansing in cold water, spend less time in the shower or invest in a more energy efficient water heater. That last change will spill savings into all your hot water use: washing dishes, clothes, pets and hands. You can feel so fresh and so clean while also being a better manager of money and energy. 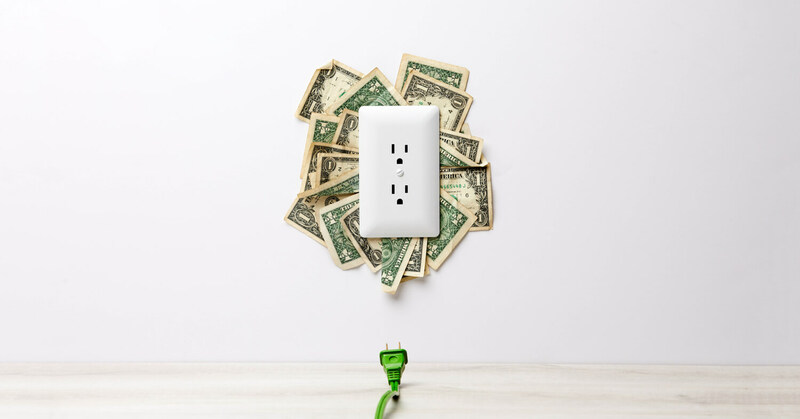 Want to save up to 15% of your annual utility bill? Make sure your home is air sealed and well insulated. (6) (Insulation is that pink stuff in your walls and attic that you thought was cotton candy as a child.) If your home is not well insulated, you could be shooting some of that heating and cooling straight into the streets. Okay, that’s not how it really works. But if you ignore this one, your units could be working overtime to keep your house the perfect temperature, which means more energy lost and more money spent. 7. Regularly keep up with HVAC maintenance. This is a tip brought up by financial expert and best-selling author Rachel Cruze. You know how we’re conditioned to get the oil changed in our car on the reg? How many of us get our HVAC checked out by professional on the reg? Show of hands, please. Oh, we see you there in the back. Nice! But for the rest of us who have never heard of or done this, establishing this yearly routine is an excellent way to save money. A tune-up costs around $100, but it can extend the life and increase the function of your unit. Rachel also reminds us to change out our air filters! Those dusty chumps can mess up your air flow if you aren’t consistently swapping out old filters with new ones. Also, think about it. Yuck. Change your air filters. Most people set up their insurance and leave it until they move. If this is you—first, we say a big bravo for getting homeowner’s or renter’s insurance. Next, we want to encourage you to check in on it. Talk to an independent insurance agent. Their loyalty is to you, not to a specific company, so they’ll shop around until they find the best fit and rate for where you are in life. You can save hundreds a year with minimum effort. 2. Take out higher deductibles. You know you’re an adult when people start throwing out terms like investment portfolio, itemized deductions and deductible at dinner parties. Even the words dinner party are so grown up, right? But at said dinner party, you might find yourself nodding your head without really understanding what on earth people are saying. Like—what is this deductible everyone’s talking about, and how does a higher one help you save money? When you get homeowner’s or renter’s insurance–which you need—the deductible is the amount of money you would pay out of pocket before your insurance company pays their portion. Insurance policies with higher deductibles have lower premiums—meaning they cost you less monthly! Of course, you’d have to pay more in an emergency, so wait to raise that deductible until you’ve got your fully funded emergency fund in place to cover anything that—God forbid—comes your home’s way. 1. Take on one manageable project at a time. When you look around at the outdated countertops, stained carpets or mismatched fixtures in your home, it can feel like an overwhelming swirl of things to do. But instead of maxing out credit cards on a huge reno—and instead of sitting around feeling discontent—put a little in the budget each month and knock out projects one piece at a time. Watch for sales along the way. You can have an impressive before-and-after photo to share on social media. It just might take you a little longer to get from start to finish. But when you’re done, you can have all the ta-da! without any of the debt. 2. Save up for bigger renovations. If you’re dreaming of a huge remodel, you can cash flow it. Seriously. It takes budgeting, saving and waiting—but you can take responsible steps toward making your dream home remodel a reality. Start by pinpointing the project, researching the cost, and then setting up a sinking fund in your EveryDollar budget. Be sure you’re making a proper investment by renovating things that will create a better living environment, while also increasing your home’s worth. In other words, put your money where the payoff happens both now and later. 3. DIY the home repair when you can. It’s pretty fantastic what you can learn to do on YouTube these days. Contour your makeup until you look like a completely different person. Learn self-defense moves that rival Chuck Norris’. And watch step-by-step guides to basic home repair. That last one can come in quite handy when you’re needing to fix a simple leak in your toilet but don’t want to pay an hourly rate for what might be a five-minute job. Please note: Certain jobs—such as electrical or structural repairs—should be left up to the professionals. Don’t risk your life or home to save money. For those assignments that need an expert, do you know someone who’d be interested in trading skills? You could offer to design their website, photograph their family, or help them file their taxes. Go old school and barter your expertise for theirs. 1. Downsize your house or apartment. There are plenty of financial reasons to downsize. Maybe your mortgage is eating up a huge chunk of your income, your kids recently moved out, or you just don’t need a place in the center of the action anymore. If any of these apply to you, it could be time to move on. Literally. You may even net enough to pay cash for your next house and enjoy a downsized life without a mortgage! That could save you upwards of $12,000 a year to cash flow home renovations, add to your retirement, and start your folk-style, boy band tribute group without financial pressures or guilt. Smaller home, bigger dreams. It might be the trade of the century. If you're looking to downsize your home, connect with a trusted real estate agent. 2. Figure out if refinancing is right for you. You have an Adjustable Rate Mortgage (ARM). You have an interest-only loan. Your mortgage has more than a 15-year term (such as 30 or 40 years). You have a high interest rate loan. If you're looking to buy or refinance your home, connect with a mortgage expert. 3. Save up a proper down payment. Things you should never rush: deepening a relationship, baking macarons, and buying a house. We can’t help you with the first two, but we have plenty to say about the last one. Don’t buy if you aren’t financially set up for success. What’s that mean? You want a proper down payment saved: 10–20%. If you have that 20% to put down, you’re going to miss out on private mortgage insurance (PMI), which next to the stomach flu going around at work, is one of the best things to miss out on. 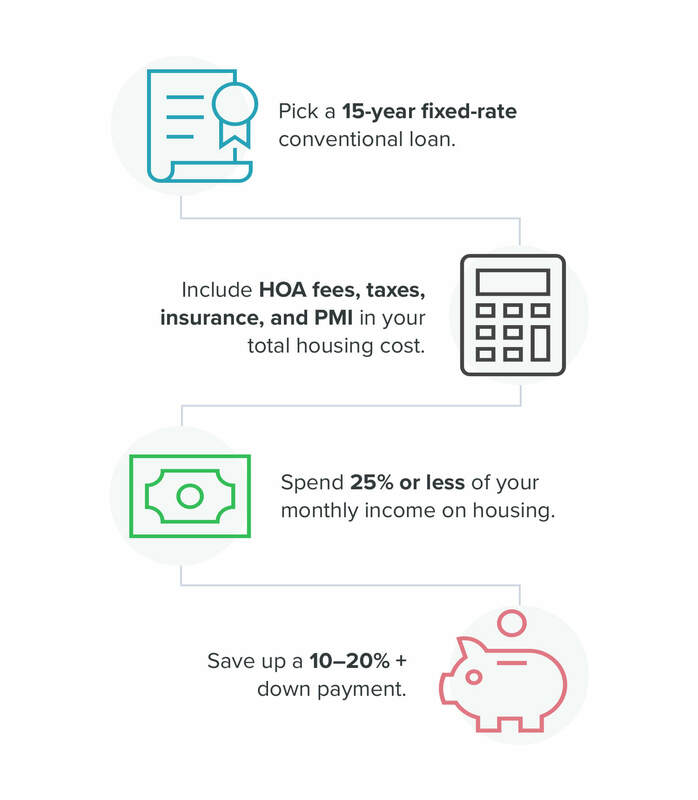 Check out this handy graphic for all the other details on home-buying best practices. 4. Buy or rent an affordable home. Notice that “spend 25% or less of your monthly income on housing” bit above? This is one of the top ways to save on housing. Don’t get house poor. Have you heard that term? It’s when too much of your income is going into your mortgage or rent, leaving you feeling poor in all other areas. Yes, you need shelter. Yes, you want a nice place to live. But you don’t want to spend so much on your house that you can’t afford to ever leave it. Even hermits like to go out for tacos once in a while. Don’t be house poor—be house wise by living that 25% life. It looks good on you. Your home should be a blessing to your life, not a bully to your budget. These helpful tips can free up more money for what matters to you. And if you can do only one thing on this list, contact an independent insurance agent. It’s one of the easiest ways to save some serious money on your beautiful abode.